I’m sitting by the rocks on the riverbank, precisely 2, 130 miles north of the Gulf of Mexico and 1.1 mile south of Big Stone Lake. That’s what the big wooden sign says, anyway, here at the headwaters of the Minnesota River. Usually I sit further upstream, closer to the lake than the Gulf, where pelicans gleefully nab dumbstruck perch from the water rushing out of the spillway, ignoring the fishermen standing midstream a few feet away. Today, though, I sit downstream, where the water barely seems to move. I watch a hundred frenzied small birds dart in and out from under the highway bridge as though there’s something important to accomplish and with all their flapping they’re accomplishing it. I feel more akin to these angry birds than I do the playful, full-bellied pelicans wiping fish scales off their long orange lips with the back of their wings. I have an ice cream cone. It’s melting onto the grass. I stopped on the way to the headwaters because Julia Cameron asked me to list five of my favorite childhood foods, and then indulge in one. I didn’t list five; I listed two. The chocolate-dipped cone from Dairy Queen wasn’t on the list, but it probably should have been. I just didn’t think of it when she put me on the spot like that. And now I’m feeling angry at ice cream, something a reasonable person should never, ever do. The margins of The Artist’s Way are splattered with retorts to what I read as the text’s paranoid accusations. Do not expect your blocked friends to applaud your recovery. Blocked friends may find your recovery disturbing. (p. 57) Why must I be conditioned to think everyone is out to get me? Am I not already cynical enough for you? Be particularly alert to any suggestion that you have become selfish and indifferent. (p. 57) But isn’t it possible that we are selfish and different? Can we not trust ourselves to be objective enough to pay attention to those with valid cautions? We tend to think such behavior [focusing on our responsibilities to others] makes us good people. It doesn’t. It makes us frustrated people. (p. 57) Good people can still be frustrated. Do not let friends squander your time. (p. 57) Yeah. Better to be unfriendly but creative. We want to set aside time for our creative work, but we feel we should do something else instead. (p. 57) Crap, Julia! Sometimes I really should go do something else. I knew this study would be difficult. The Managing Editor suggested I might “playfully struggle” through. But when I curse ice cream for Pete’s sake, one must wonder what moved me past playful struggle to perfectly angry. And here we reach a place where I can agree fully with Cameron: anger is a throbbing red pointer finger. I may be an emotional neophyte in many ways, but anger (an emotion I’m good at) is something I have long trusted as a visible indicator of something else below the surface. Psychologists will tell us that anger is a secondary emotion, one that is always triggered by another: fear, hurt, humiliation, etc. As I wonder what has the small birds in such a lather — what are they so afraid of? — I consider the same about myself. For it is clearly fear triggering my angry response. Fear of loss. I know that to embrace even a fraction of what Cameron advocates and more fully pursue the openness and freedom of a creative way of life, it means change. And even for the good, change spells loss. I sense the loss already. Cameron requires a decision with every chapter. What will I embrace? What will I discard? What will either choice cost me? There’s a good sized lake just over a mile to the north. I could sit with the pelicans in its wake and snag perch all day long. I wipe vanilla soft serve off green blades of grass and look to the south, where the water barely stirs but I know, just past the bridge, the current could take me clear to the ocean, two thousand miles away. We’re exploring Julia Cameron’s The Artist’s Way together. How do you face resistance — internal or external — to your creativity? What made a mark on you from these chapters? Did you experiment with Morning Pages or an Artist Date? Perhaps you’d share in the comments about your experience or any of the tasks you tried. For next week, we’ll consider parts 4 and 5, Recovering a Sense of Integrity and Recovering a Sense of Possibility. Feel free to do one or both chapters. Post and photo by LW Lindquist. Why did the end of this give me shivers? It just did. the fact that you even feel what you feel. It says to me that you are doing the work of thought, of adventure—that you would feel the anger—and more than that… that you would try to look beyond the anger into direction and embrace. So many people simply never get to that place (and either live their lives in depression, or sabotage others, or siphon from them). This here? Raw realness. Of a real artist, eyes open. My contribution to this week’s discussion is my first found poem, words/ideas taken from pages 52-54 that caught my imagination: http://breathedeeply.org/2012/05/30/capacity/. Thanks for letting me peek in on your discoveries. Haven’t made time for coming along on the read. Too much stress in trying to keep up, so like an ‘ol gal, I sat down to watch for a minute before heading off to work. Thank you for this honesty. You and Diana are being very true to your observations. Snatching a few minutes for myself during this final week of preparing for my baby’s wedding! And I had a melt-down last night after my grown-up baby girl had tried to help by stripping all the beds and starting the laundry and leaving it all undone to spend time with her groom. After I recognized the anger, I chopped veggies like crazy and asked why? What nerve did all that helpfulness hit so powerfully? I think I need to find a swing and make up a nonsense song like I did as a child! Thanks for your honest reflections, Lyla! You continue to challenge my thought processes, making my life more deliberate than it would be without your input! So I am little behind in the reading and hope to catch up today but want to just say out loud that it shocks me how every smack in the head I give myself along the way is somehow miraculously delivered a return dead knock out punch by the words of the book, as if Julia Cameron herself is saying “HEY… KNOCK IT OFF BUSTER AND WORK ON YOUR OWN BLOCK INSTEAD OF SMACKING DONNA AROUND!” (and yes I realize BUSTER is me, too)…. but it makes me feel valid and like maybe this isn’t such a crazy thing for me to do, or at least not a “bad” crazy. Case in point… at the risk of revealing maybe too much I will say that the thought has crept into my head these last few days of how I want to belong here in much the same way the awkward little girl with glasses wants to get picked for the kickball team … (as the quiet prayer of all of these little ones goes; please god please GOD let someone anyone pick me and don’t let me be the very last one so that i am not the boobie prize because who wants to be the stupid boobie prize?)…. and I think “hey yeah Donna, a little needy are we… get a grip girl you are playing with the grown ups now and did you get the memo you are 52 years old for heaven’s sake so get over it puhleez”. grrrrrrowl and snarl. So finally after procrastinating in a million ways I finally pick up the book and there, first line, I see these words: “One of our chief needs as creative beings is support.” Okay Julia. You win… and thanks. Next time you need ice cream, I live less than an hour away from the headquarters of the Mississippi and my freezer is very accommodating when it comes to ice cream. Your review was refreshingly honest. You know, I appreciate you so much. If you identify with the small birds, I identify with the fishermen a few feet away from the successful pelicans. You know I love this. Yes, I love this. And you, too. I think maybe you’re my emotional doppelganger? This feels SO familiar. And those notes in the margins? Coulda been mine. Some of them WERE mine. And Donna – I get the way you’re feeling, too. Somehow that little girl with the glasses never really leaves us – she needs some TLC from time to time, though. Do you have a blog? Cause if you do, I’ll read it. Cindee, thanks for that. And to be sure, there are parts I’m skipping over and around. Some, I just can’t seem to escape though. Pat, I’m just glad to have you come sit for a little bit. I like your company. Donna, this from your piece the other day: “what makes you think that I wouldn’t enjoy coming out when the sun is already shining?” It really made me think, and I really appreciate it. What you’re exploring there is really important. And I’m glad you’re exploring it here a bit with us. You come, dip in your toe, play a little; you belong. Trust me. i find that julia takes focus from one thing and puts it on another thing…when relationship with God better than any one focus. i can have many things, and none of them need be my main focus. in other words, i don’t need to give-up as much as one may think, to be an artist. it is mainly in how wi look at things, anyway. creative thinking is mainly about looking at something from more than one perspective. not an either or…but, both and more. there is no use going from one box to another box. Be alert to the disturbing; then, indulge! cone still melting and me, feet away, splattered. I knew this study of Julia would be difficult. Julia is not in recovery. Julia is never blocked. good people from rushing to angry psychologists. to shout, plea, demand but I want to be emotional. how to squander vanilla. It’s something she’s better at. Nancy, I appreciate that. It’s not an either/or but a both/more. I think, at least for some of us, there is more to give up and change than one might think. Okay, this is spooky. We’re both sitting by the river with a throbbing red pointer finger and quoting the same passage. And I can’t believe you would even dare pick something as sticky and messy as a DQ ice cream cone. You seem more like a malt girl to me. That is MUCH safer. The ones at Garden of Eat’n in Canton are the best. I’ll buy you one next time. Oh – this is the way to make your way through the book: just do it honestly. I have been reading some and struggling, but then I just kind of stopped. I think I am spooked by Julia for some reason. But you, you just keep doing the hard work and whether you are arguing with a ghost or not, you are becoming someone new, maybe better even. I did do an “Artist Date” last week; I took myself to a favorite art museum and went to all the gardens and galleries I don’t usually visit. It was refreshing, and it definitely left me wanting to write. In fact, just remembering that day reminded me of something painful I discovered. Maybe I see ghosts, too, and maybe she wants me to start right there where the pain it. Jennifer, I cleaned it up. Wiped each little blade of grass with my napkin. I did love a chocolate malt though. Back in the day when you got the portion in the glass and then the metal cup with another serving. .
Monica, I was thinking along those lines when you said that. Not that you were jealous, no. But that the fishermen may have had some frustration with the pelicans grabbing the easy perch out of the spray. 🙂 Love that you went there with that. It was pretty unintended on my part. Sandra… I love your word… spooky. So many things connected to this are ‘spooky’ and so cool! And Glynn your poem is stunning – happy birthday to your wife! Such a gift you have given. Diana… Yes, she is always here… I just don’t like it when she takes the wheel! I do have a blog. 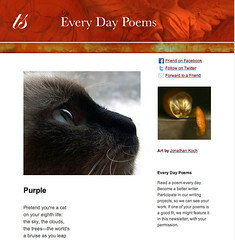 A new old blog called Along the Way, and it’s here: http://unmixingcolors.typepad.com/along_the_way/. I think if you click my name above it takes you there like magic! Thanks so much for asking… I’d love to have you stop in! And L,… thank you. :O) I appreciate your kindness and your sharing, and your invitation to stick around. I will. I like it here. reply: it depends on one’s definitions and aim. The title provides a 3 word critique. I am enjoying your review of the book. A better exercise of writer’s block would be to suppress my inane poetic attempts. Keep up the good work for the more serious followers of the series. Unknown small birds flit about. Are they angry, there’s some doubt. for a nose, ergo, to setup house keeping. upset about the White Sox batting order. irked because they forgot the words. that chirping, not mooing means they’re coping. revealing they’re Rich Little wannabes. and curse the users of spray-on Deet. yet can’t refrain from waxing Poetic. Grackles, sparrows, keep their counsel. I totally can relate with this line – Do not let friends squander your time. (p. 57) Yeah. Better to be unfriendly but creative. – With friends around, I tend to do things with them on my free time which is mostly making me unproductive because we’re just chatting our time away. But, if I’m not with friends on my free time, i can do my own thing and that’s being creative.